If you’re shopping for a point-and-shoot compact camera, you’ve come to the right place! 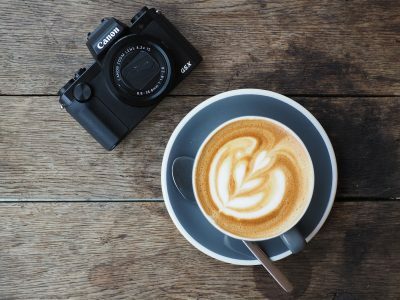 At Camera Labs I write in-depth reviews of cameras but understand you’re busy people who sometimes just want recommendations of the most outstanding products. So here I’ll cut to the chase and list the best point-and-shoot cameras around right now. Note like my other guides they’re also listed by review date, not in order of preference. 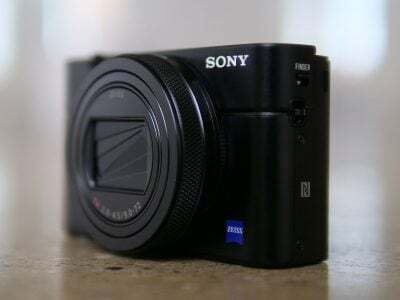 The Sony RX100 VI is a high-end compact camera aimed at pros, enthusiasts and vloggers. Successor to the RX100 V, it shares the same 20 Megapixel 1in sensor with confident phase-detect autofocus for stills and movies, 4k video, 24fps shooting with autofocus, and a wealth of slow motion video options at 240, 480 and 960fps. The small but sharp OLED viewfinder now pops-up and pushes back down in a single convenient motion, while the 3in screen can now angle both up by 180 degrees to face the subject or down by up to 90 degrees and finally gains touch sensitivity. There's also Bluetooth to complement the Wifi and a raft of pro video features, but the biggest upgrade is the lens range, up from the 24-70mm of the Marks III, IV and V to a new 24-200mm zoom in a body that's only 1.8mm thicker than before. There's an inevitable drop in aperture from the f1.8-2.8 of previous models to f2.8-4.5 here (not to mention the loss of the built-in ND filter), but the lens remains brighter than Panasonic's rival TZ100 / ZS200 or TZ200 / ZS200 models and while it lacks their longer telephoto reach, the optics are sharper and the focus tracking and burst shooting are more confident. Dedicated vloggers may remain better-served by the lens on the previous model (now mildly updated as the RX100 VA), but if you’re after a do-it-all pocket travel camera, the RX100 VI has taken the crown. 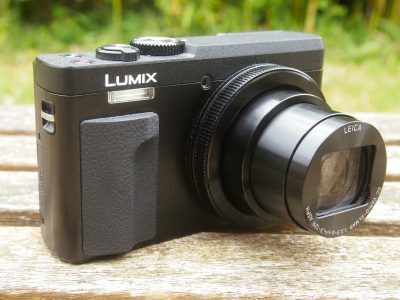 Panasonic's Lumix TZ200 / ZS200 is the new top model in its enormously popular travel-zoom series. 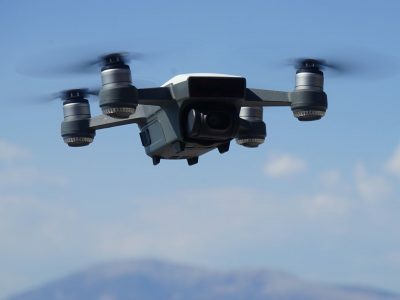 Successor to the TZ100 / ZS100, it inherits the 1in / 20 Megapixel sensor, built-in viewfinder, non-tilting touchscreen, 4k video and Wifi, but boosts the earlier 10x zoom range to 15x, increases the viewfinder detail, adds 1080 video at 120p for slow motion, and now includes Bluetooth for seamless connectivity and location-tagging. The literally big news though remains that new 15x zoom range, equivalent to 24-360mm and easily out-gunning not just its predecessor, but all rival 1in compacts with pocket bodies. The only compromise is an aperture that's become even dimmer at f3.3-6.4 versus the f2.8-5.9 of its predecessor, which in turn was already a lot dimmer than the f1.8-2.8 of rivals with shorter zooms. But that's the compromise you have to weigh-up. If you want a 1in sensor with a big zoom that's also bright, you'll need a much bigger body like the Sony RX10 or Lumix FZ2000. Ultimately for many photographers, the TZ200 / ZS200's combination of a big zoom and decent sensor in a pocket body is all they need to know: the lens range and feature-set are unbeatable in its class and like its predecessor it comes highly recommended. The Canon G1X Mark III is a unique camera, squeezing a large APSC sensor - the same found in the EOS 80D and EOS M5 models - into a relatively compact weatherproof body with a 3x optical zoom, built-in viewfinder, fully-articulated touchscreen, plenty of manual control and excellent wireless capabilities. The sensor also boasts Dual Pixel CMOS AF, allowing it to smoothly and confidently refocus for stills or movies. These all make the G1X Mark III one of the most powerful compacts to date, but there's still no 4k video, nor microphone input, and the big sensor also makes it one of the most expensive compacts around. Revealingly its rivals with smaller 1in sensors typically couple them with brighter lenses, allowing them to roughly match the G1X Mark III on resolution, noise and potential for background blurring, but there's no arguing with the APSC sensor's superior dynamic range, allowing the G1X Mark III to capture a greater tonal range and more saturated colours. Don't underestimate the appeal of squeezing the photo and movie quality of the EOS 80D into a compact weatherproof body weighing less than 400g either. 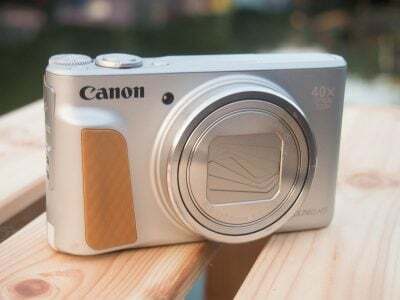 The G1X Mark III may have some annoying omissions for movie shooters, but remains one of Canon's most compelling compacts appealing as a standalone camera or a companion to larger DSLRs. Check prices on the Canon G1 X Mark III at Amazon, B&H, Adorama, or Wex. Alternatively get yourself a copy of my In Camera book or treat me to a coffee! Thanks! 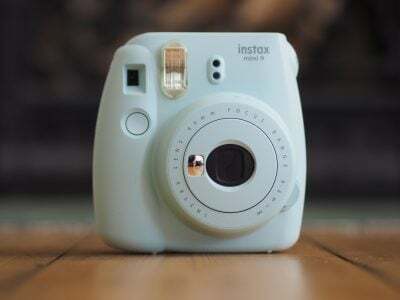 The Instax Mini 9 is one of the most affordable cameras to use Fujifilm's hugely popular Instax Mini film cartridges - these produce small business card size prints which emerge seconds after taking the photo and self-develop before your eyes within a minute. The Mini 9 is almost identical to the best-selling Mini 8, but adds a small mirror by the lens for framing selfies, is supplied with a close-up adapter lens, and available in five pastel colours. Like other Instax Mini cameras, don't expect 100% accurate framing with the basic viewfinder and beware that prints can often be over-exposed under very bright conditions. If you want instant pictures with accurate framing and guaranteed exposure, then consider Fujifilm's digital Instax SQ10, or their portable Instax printer that'll talk to phones and other cameras. But once you understand what Instax Mini can and cannot do, it's enormous fun. I've not met anyone, young or old, who's not spellbound by a low-cost camera that pumps out instant prints, and it's perfect for events or breaking the ice in street photography. There are more sophisticated and compact models in the Instax Mini range, but I'm fond of the basic charm the Mini 9 inherits from its predecessor. Once again it may not cope with all conditions, but I still believe very home should have one. Refreshingly retro and recommended! Check prices on the Fujifilm Instax Mini 9 at Amazon, B&H, or Adorama. Alternatively get yourself a copy of my In Camera book or treat me to a coffee! Thanks! 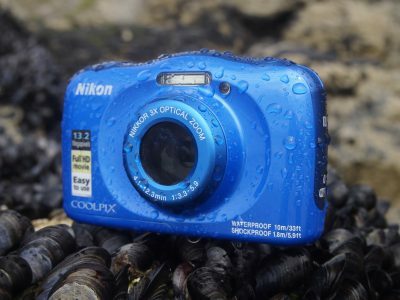 The Nikon COOLPIX W100 is a budget point-and-shoot waterproof compact. If you were asked to describe it in two words they would be simple and inexpensive, given a couple more you could also add fun and stylish. With a 3x optical zoom, a 2.7 inch screen and a small sensor of the kind found in mobile phones, it has a fairly basic specification, but the icing on the cake is WiFi and Bluetooth connectivity which with Nikon's SnapBridge app lets you automatically transfer all your photos to your phone in the background while you shoot. You can also remotely control the camera with your phone. So it's an inexpensive no frills waterproof compact that scores highly on connectivity and ease of use. We highly recommend it, either for the kids or as a holiday camera you can take anywhere and not worry about. Check prices on the Nikon Coolpix W100 at Amazon, B&H, Adorama, or Wex. Alternatively get yourself a copy of my In Camera book or treat me to a coffee! Thanks! 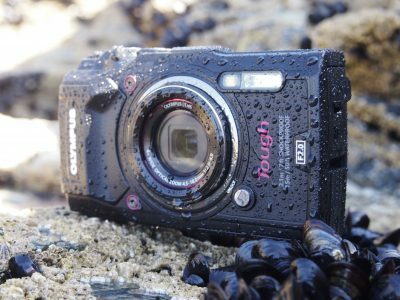 Check prices on the Olympus TOUGH TG5 at Amazon, B&H, Adorama, or Wex. Alternatively get yourself a copy of my In Camera book or treat me to a coffee! Thanks! On the face of it, Panasonic’s Lumix TZ90 / ZS70 doesn’t add a lot to the earlier TZ80 / ZS70. The touch screen flips up and over and there’s a new 20 Megapixel sensor which delivers better quality 4k UHD video. However, with a 30x optical zoom, built-in viewfinder, great continuous shooting, 4k UHD video with PASM exposure control, 4k photo modes, RAW recording, and a wealth of other features, it remains one of the most powerful pocket super-zooms around and comes Highly Recommended. But if you can live without the flip-up screen the earlier TZ80 / ZS60 is well worth keeping in mind. Panasonic's Lumix LX10 / LX15 is a highly compelling premium compact which bravely goes head-to-head with the big hitters from Sony and Canon. Rather than producing a me-too version, the LX10 / LX15 features a number of unique differences which stand out from the crowd: a 24-72mm f1.4-2.8 lens that's brighter and focuses closer than most when zoomed-wide, generous 15 minute 4K movie clips, and Panasonic's wealth of clever 4K Photo modes which now let you refocus and adjust the depth-of-field after the event. You're also getting a touchscreen that tilts up (albeit not down), 1080 video at 120p for slow motion, decent Wifi features and USB charging. There no built-in viewfinder, nor ND filter, but for the price this won't bother most buyers. Ultimately the LX10 / LX15 is a welcome addition to the increasingly crowded premium compact market and one I can highly recommend. Check prices at Amazon, B&H, Adorama, or . Alternatively get yourself a copy of my In Camera book or treat me to a coffee! Thanks! The PowerShot G7X is Canon's answer to Sony's RX100 series, packing a larger than average 1in sensor into a pocketable body. The G7X Mark II is the latest version, sharing the same 1in sensor and 4.2x / 24-100mm / f1.8-2.8 zoom as its predecessor, but now with an improved grip and a touch-screen that can angle down as well as flipping all the way up to face the subject for selfies, or filming pieces to camera. Behind the scenes the 1in sensor is coupled with Canon's latest DIGIC 7 processor which supports timelapse movies, in-camera RAW processing and improved tracking and subject detection. As before its major rival is Sony's RX100 III with the Canon boasting a longer zoom and touch-screen, while the Sony sports a built-in viewfinder. 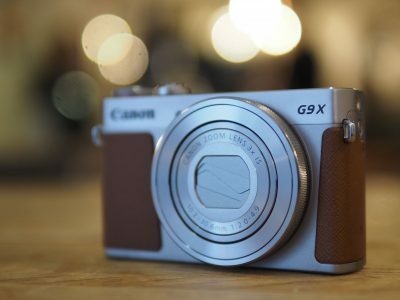 If you want the same quality in an even smaller body, consider the G9X which may have a shorter zoom and lacks the tilting screen, but measures roughly the same as Canon's S120. 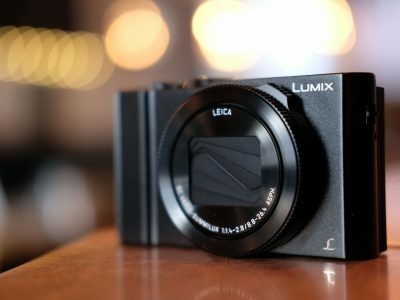 Or if you want the same quality but with a longer zoom in a body that's still pocketable, there's Panasonic's Lumix TZ100 / ZS100. The market for 1in compacts is growing steadily, but the G7X Mark II strikes a great balance of features for the money. Check prices on the Canon PowerShot G7X II at Amazon, B&H, or Adorama. Alternatively you could treat me to a coffee! Canon's PowerShot G5X is one of the most capable compacts around, delivering much of the experience of a larger camera in a smaller, lighter and often cheaper form factor. 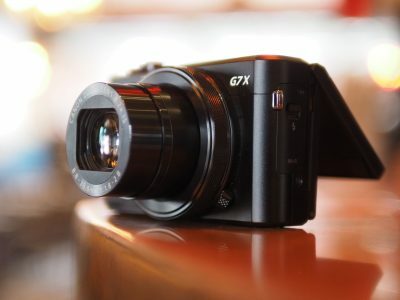 The really clever part is it's essentially based on the best-selling PowerShot G7X, but enhances it in a number of key respects to become a much more satisfying camera to shoot with. For me, the G5X is more of a standalone camera than one that would partner a larger system. It's a confident all-rounder I greatly enjoyed shooting with over an extended test period and one I can Highly Recommend if you're happy with the 1in quality and don't need pocket dimensions, 4k video or a longer zoom. Check prices on the Canon G5X at Amazon, B&H, or Adorama. Alternatively get yourself a copy of my In Camera book or treat me to a coffee! Thanks! 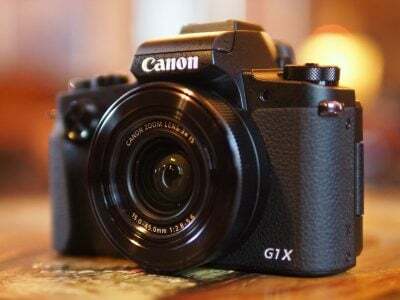 Canon's PowerShot G9X is the slimmest traditional compact to feature a 1in sensor - giving it superior quality to most phones and compacts but without compromising its pocketability. Indeed the G9X is almost exactly the same size as Canon's earlier S120, despite sporting a sensor with roughly three times the surface area. As you'd expect for a small body with a larger than average sensor, the zoom range isn't huge - just 3x - but the 28-84mm range still covers most needs while the 5cm macro and f2 aperture at the wide end allow for respectable close-ups and relatively shallow depth-of-field effects. Impressively for its size there's a mode dial with a wealth of shooting options from full Auto to full Manual, while the touch-screen interface presents quick and easy access to all the settings. 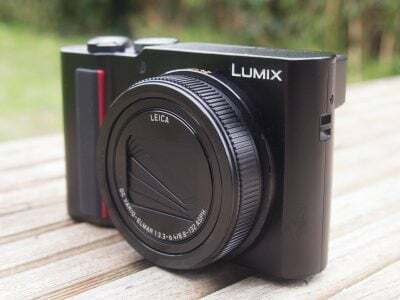 Indeed the combination of pocket size and the touch-screen makes it one of my favourite compacts around, although compare it closely with the chunkier G7X (Mark I or II) which squeezes-in a longer zoom and a tilting screen, often at a bargain price. Check prices on the Canon G9X at Amazon, B&H, or Adorama. Alternatively get yourself a copy of my In Camera book or treat me to a coffee! Thanks!